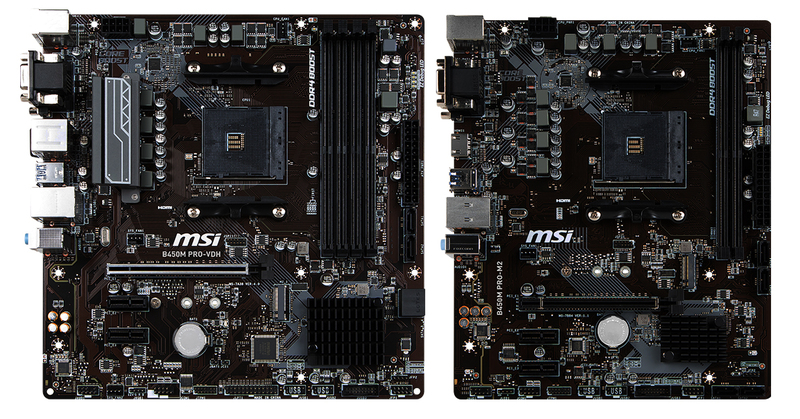 Last up from MSI is a pair of microATX motherboards from the Pro series of motherboards, the B450M Pro-M2 and B450M Pro-VDH. Both models share the same black PCB with brownish traces and tracks, while the B450M Pro-VDH makes use of a heatsink on the CPU section of the power delivery, whereas the B450M Pro-M2 omits power delivery heatsinks completely. Both have a square black metallic chipset heatsink with a fin array. Both models have a full-length PCIe 3.0 x16 slot with both featuring metal reinforcement; the B450M Pro-VDH having the most predominant looking of the two. Also included on both is a pair of PCIe 2.0 x1 slots for expansion cards. The Pro series microATX pairing have four RAM slots supporting up to DDR4-3466 memory and have the ability to support up to 64 GB. ECC and non-ECC modules are both supported, albeit with installed ECC memory operating in non-ECC mode. Storage wise, both boards have a total of four SATA 6 Gbps ports with the ports on the B450M Pro-M2 all featuring straight angled connectors, and the B450M Pro-VDH having two right-angled and two straight angled connectors. Both models have a single M.2 slot capable of supporting both PCIe 3.0 x4 and SATA M.2 2280 (22 x 80 mm) SSDs. While both virtually identical in terms of overall specifications, the main difference comes on the rear panel. 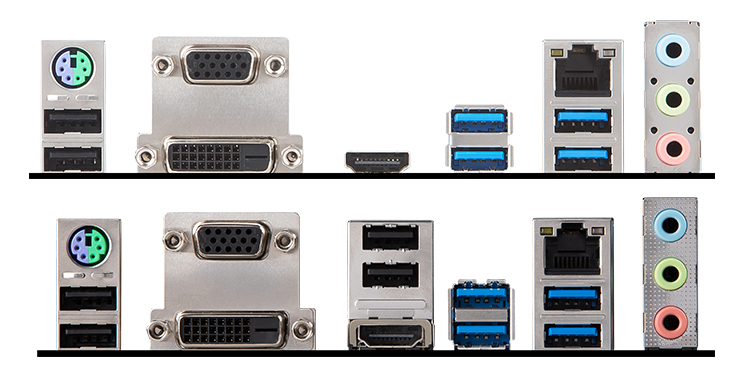 Both feature four USB 3.1 5 Gbps Type-A ports and two USB 2.0 ports; the B450M Pro-VDH has an additional two USB 2.0 ports giving it a total of four. Both boards have DVI-D and HDMI 1.4 video outputs, as well as a PS/2 keyboard and mouse combo port. The three 3.5 mm audio jacks on the B450M Pro-M2 is provided thanks to a Realtek ALC887 audio codec, whereas the B450M Pro-VDH utilizes a slightly more premium Realtek ALC892 codec. The LAN ports on both models are controlled by a Realtek 8111H Gigabit LAN controller. Users looking to make the most of their new Ryzen 1st or 2nd generation processors, or even one of the Ryzen APUs with integrated Vega graphics cores without all the gaming-themed stylings and RGB could potentially save a bit of budget by opting for a Pro series board. While pricing hasn’t been unveiled as of yet, the B450M Pro-VDH is likely to cost a little bit more than the B450M Pro-M2 which is set to retail for $69.99 due to a slightly higher-grade audio codec and the M2 having no power delivery heatsinks supplied.